In a small saucepan, combine water, all the seasonings, and the salad dressing mix. Stir well with a whisk, and bring to a boil. 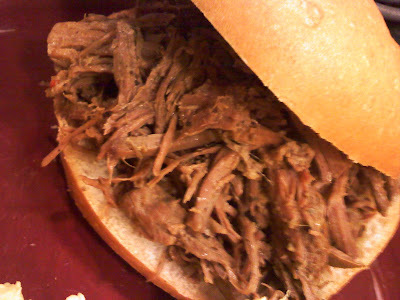 Put the roast in your crockpot, and pour the mixture over it. Cover and cook on low for 10-12 hours, or on high for 4-5 (I cooked mine on high for 2 hours, then on low for 5). Remove bay leaf and shred meat. Serve on rolls. This was really good. Not as good as some I've had, I think it could use more flavoring, maybe another half a packet of Italian Dressing, but still tasty. The meat was SO tender it took nothing to shred it. We all liked it, including our 2 year old so you know it was pretty good! I'd give this a 3.5 Star rating, because we did like it, but I still think it's missing something.